“The crosswalk will be right there at that intersection, and then there will also be several new islands in what's currently the turn lane on Highland, which will feature planters,” University Neighborhoods Development Corp. executive director Cody Fletcher said. Fletcher said this intersection was chosen as the epicenter of the enhancements to encourage walkability for students and patrons who frequent the Highland Strip by slowing down traffic and improving pedestrian safety. In addition to the traffic-calming installments around Highland and Walker, the UNDC plans to install a network of SkyCop cameras in the area, with about 30 slated in the first phase. “Then, as we move forward, we'll just expand from that Highland Strip focus further down Highland and then also into the other neighborhoods surrounding the campus,” Fletcher said. If everything goes as planned, this first salvo of projects should begin construction within the month and wrap up in October. 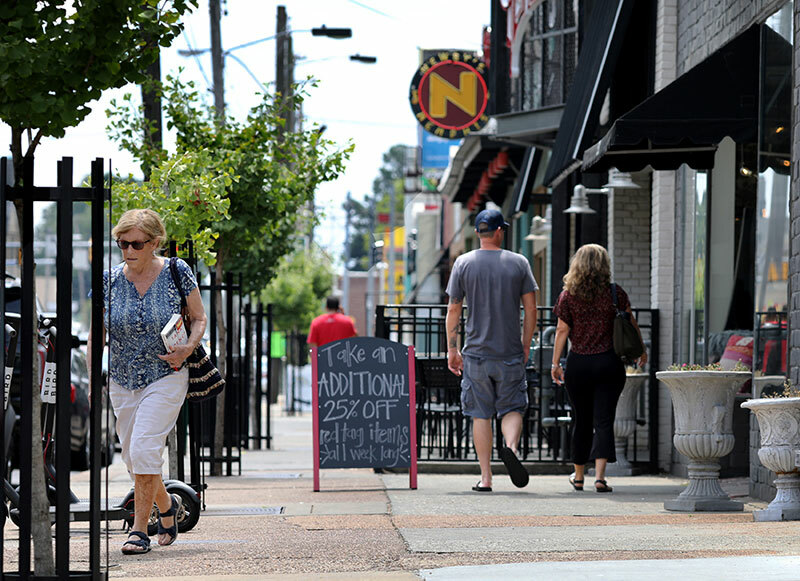 Fletcher noted these new installments will only be temporary, as the UNDC has tapped architectural firm LRK to completely redesign the infrastructure around the Highland Strip. Though the UNDC has been around since 2003 as an independent nonprofit, the organization got an overhaul in 2016 when it decided to apply for the TIF. Fletcher was then brought on in somewhat of a dual role to serve as both the executive director of the UNDC and as a member of the university’s government relations department. Ted Townsend, chief economic development and government relations officer with the U of M, said the university sees the TIF as an economic driver to helps unlock projects that enhance the campus experience for the students. “With Highland being a major artery that our campus resides along, creating traffic-calming is incredibly important to us so that our students, faculty and staff can enjoy the benefits of the renaissance of Highland Strip and get over there safely, first and foremost,” Townsend said. He said these projects could run the gamut, from those driven by students or researchers to working with small to medium-sized businesses within the footprint of the campus.